For more than 35 years, the Restivo family has been bringing their Italian heritage to Sarnia one plate at a time. We’re proud to offer you a wide assortment of gourmet Italian dishes that are sure to tantalize your taste buds. Our food isn’t your typical pasta in-a-box. No, it’s fine dining at its best. Embrace tradition and satisfy your cravings with our mouth-watering dishes served to you by our team of friendly servers and top-notch chefs. We don’t skimp on the portions, either! Our servings are large enough to satisfy even the hungriest gourmand. 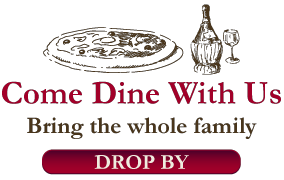 For our full menu and pricing, click here. With two luxurious dining rooms at our restaurant, there’s always a place for you at our tables. Sit back, relax and enjoy scrumptious seafood, perfect pizza or one of our famous house specialties. Whatever you’re in the mood for, we can serve it up to your exact liking. We also have a fully licenced bar, so we’re the perfect place for work events or family gatherings. For foodies on-the-go, we also offer take out. Bring the taste of Italy home with you today! To top off your meal, treat yourself to our smooth and silky vanilla ice cream, authentic Italian lemon ice or delicious cannolis that are just like nonna used to make. Or, just like in Italy, sip on our gourmet espresso as you enjoy the company of your friends and family. 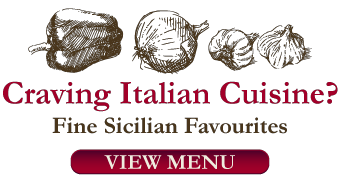 For authentic Italian fare that will leave you wanting more, visit our restaurant today! Recommended by "Where to Eat in Canada"